ParkMeApp is a proud product put forth by Ceffectz (Pvt.) 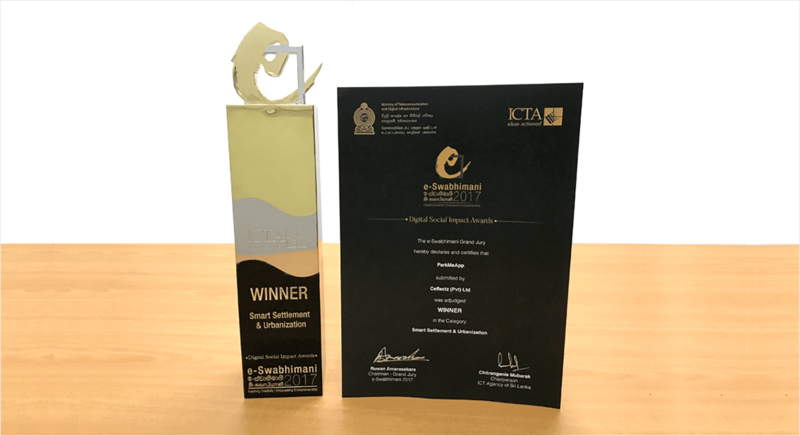 ltd, which have been recently awarded as the Winner at the e-Swabhimani awards 2017 under the Smart Settlement & Urbanization category. The Award was presented to ParkMeApp on 30th November 2017 held at Galadari Hotel, Colombo. Among many other awards presented to ParkMeApp, this is yet another satisfied victory for the Ceffectz family! The e-Swabhimani is an initiative of the Information Communication Technology Agency of Sri Lanka aimed at recognizing excellence in digital application creation. These national awards are intended to stimulate a greater interest in the development of a wide range of content and services that would serve the needs of the society. The e-Swabhimani awards are presented under 9 categories. Among which, ParkMeApp competed under the “Smart Settlement & Urbanization” category. This category entails ICT solutions that support; higher levels of economic productivity, productive employment, Support positive economic, social and environmental links and such criteria. This sure is a tremendous accomplishment by ParkMeApp. ParkMeApp is an essential mobile application for today’s fast developing nations. This helpful invention provides parking solutions where this application is available for use by both Android and iOS users. ParkMeApp pays detailed attention on the usability and the user experience. They have worked their way through many huddles to come up with the best UI/UX designs and the functionalities to provide a superior service to their customers. ParkMeApp eases the pain of searching for a parking spot. Thanx to ParkMeApp, the drivers no longer have to circle the block to find an alternate parking spot, as this application will show where exactly the parking facilities are available. This is an essential piece of service to our current modern and evolving Sri Lankan market. ParkMeApp include many essential and innovative features. Finding nearby locations, searching for parking spots, navigation to parking spots, Reservation and advanced filtrations are just some of the features that it offers. With feature like become an owner, ParkMeApp empower its users to earn through their app. ParkMeApp truly deserve the appraisal and the recognitions that it has been presented with and they will continue to amaze us with many improvements and innovations that are yet to be revealed by them.